May 30, 2018  One small apartment building near the U.S. Embassy in Jerusalem is emblematic of Israelis' mixed attitudes about the city. May 16, 2018  "Guatemala takes a courageous decision," President Jimmy Morales said. 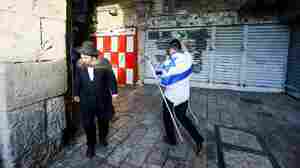 But not everyone was pleased with the Latin American nation's decision to move its embassy from Tel Aviv to Jerusalem. May 14, 2018  The U.S. selected two evangelical Christians to offer prayers at a ceremony opening its new embassy in Jerusalem. One of the pastors, Robert Jeffress, is known for dismissing other faiths. 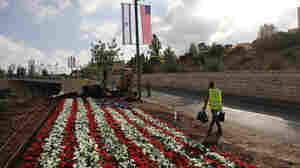 May 13, 2018  On the day before the U.S. Embassy officially moves from Tel Aviv to Jerusalem, Israelis celebrated Jerusalem Day, an annual holiday commemorating the end of the 1967 war. May 13, 2018  As the U.S. prepares to move its embassy from Tel Aviv to Jerusalem, we review the city's history with Harvard historian Derek Penslar to find out why it's perhaps the most contested place on Earth. May 13, 2018  The move on Monday of the U.S. Embassy from Tel Aviv to Jerusalem endorses Israel's view of the city — where it has reshaped the map to solidify its hold. May 13, 2018  By moving its embassy to Jerusalem, the U.S. endorses Israel's view that the city is its capital. 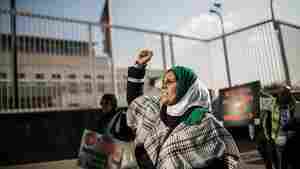 Israeli control of the city has left many Palestinians struggling to remain in a city they call home. May 12, 2018  NPR'S Scott Simon speak with author Wajahat Ali about his article in The Atlantic, "A Muslim Among the Settlers," about traveling to Jewish settlements in the West Bank. May 10, 2018  The relocation of the embassy has sparked celebration and outrage. 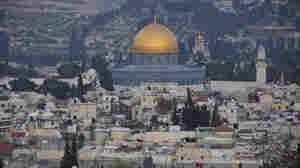 Both Israelis and Palestinians claim Jerusalem as their capital. No other countries have embassies there. 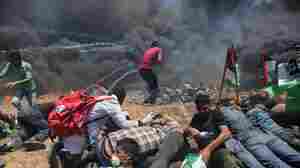 April 27, 2018  More than 40 Palestinians are dead after weeks of protests on the Gaza-Israel border, where Israeli troops have sometimes used live fire — including on Friday, when some protesters rushed a fence. April 11, 2018  Israeli defense officials allege a photojournalist fatally shot at a Gaza protest was a Hamas member. But the U.S. said he had passed a vetting process with no ties to militants. April 7, 2018  Yaser Murtaja was wearing a vest marked "PRESS" when he was hit by Israeli fire along the Gaza-Israel border. The 30-year-old was reportedly one of six reporters shot during the demonstrations. April 7, 2018  While covering the border protest, 30-year-old Palestinian photojournalist Yasser Murtaja was among those shot by Israeli troops in Gaza along the border with Israel.